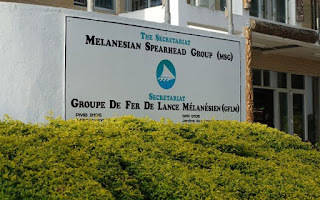 Leaders of Melanesian Spearhead Group countries have referred a West Papuan application for full membership in the group to its secretariat for processing. The leaders are having their annual summit this week in Papua New Guinea's capital Port Moresby. PNG's prime minister Peter O'Neill is hosting leaders from Vanuatu, Solomon Islands and Fiji as well as a representative of New Caledonia's indigenous Kanak people. A long-pending application for Spearhead membership by the United Liberation Movement for West Papua, which has observer status in the group, is to be processed under new guidelines for membership. It's unclear whether this means the decision is a technical or political one. The guidelines, newly approved at this summit, were developed after the leaders came to an impasse two years ago over the West Papuan bid for full membership.